Years ago I met an instructor at police college. That person was quiet, yet housed strength found in rippled muscular evidence. The evidence was topped by a simple shaved head that seemed to speak of an ability to be mean. As an afterthought that topping could have been simple acceptance of a receding hairline maintained in the quiet of a morning shave, but that is neither here nor there. In those forgotten years I remember taking another look at that person. That second look resulted in me seeing someone who had a mind of their own and a iron core of integrity. It is years later, and I inadvertently find out that officer retires…today. How would I know the morning light and its auspicious tricks with crystallized light would harken back to a class in Defensive Tactics two decades earlier? You see, that police officer trained me in Defensive Tactics. Defensive Tactics was basically training in Use of Force options which sometimes included the inevitable ground fight. The title seems to speak of a class from Harry Potter but there was no magic, no wands, no incantations. We did learn that words were used to influence peaceful conclusions in confrontational situations and we learned that Use of Force option was called “Tactical Communication”. 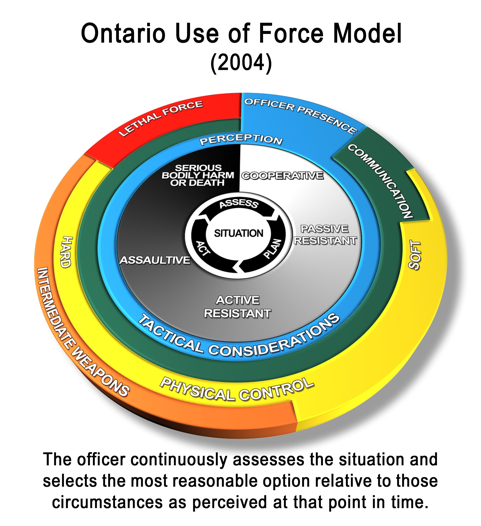 In those days in police college we also had to memorize the Use of Force Wheel to know our options were relevant to the situation. In those days “Tactical Communication” travelled most of the Use of Force Wheel. A few years into my career the Use of Force Wheel was changed, and Tactical Communication was officially determined to be an option during an entire altercation. It meant words were the most powerful weapon, or tool, that police had at their fingertips. It appears that muscled body topped with shaved head understood more than one would presume. At the end of the police training that officer took a brief moment to say something. The message was, “shortly you will all leave and wear different flashes, but remember you are all on the same team”. If it was possible I would wish every officer the wisdom to know that all of us are on the same team. That includes those of us that are simply good at writing warrants, and those of us that stand in front of the media cameras, and those of us that live stronger as a result of Operational Stress, or PTSD. It is an auspicious sunrise this morning. It is a morning that speaks of a narrow window between earth and sky where some of us understand what it means to burn off the kaleidoscope of frosted pellets containing damp air. Maybe that understanding goes beyond the flash on our respective shoulders and applies to the many with whom we collide every day. Could collisions be seen as an opportunity for collaboration? If so those crystallized pellets have successfully dispersed their preconceived light…..